Do you know what we haven’t talked about in a long time? Our fine collection of fox jewelry, that’s what! There’s something about fall that always reminds me of foxes. Sometimes, if I’m lucky, I’ll see one running at the far end of the field, red fur bright and bushy against the tree line. Foxes are beautiful animals, and jewelry artists have produced some truly stunning pieces that capture the fox’s beauty and unique personality. 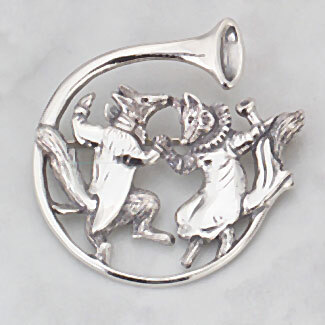 We love this sterling silver dancing foxes in a horn pin. It’s just adorable fun. Check out our dapper dancers: he’s in a coat and tails, while she’s got a gown with a ruffled collar. 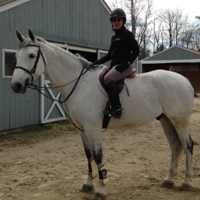 They’re so high energy, reveling on the graceful inside arc of a hunter’s horn. You can almost hear the music they’re dancing to! At an inch and a half in diameter, this is the perfectly sized fun piece of sterling silver fox jewelry. Great as a gift! Seeking a more sophisticated fox? You’ll love this simple, elegant sterling silver large sitting fox pin. Amazingly realistic, with fine detailing capturing the poised grace of the fox. This pin is nearly two inches tall – it’s a dramatic, bold piece that makes a statement. Beautiful and versatile enough to wear as a signature piece. Priced perfectly to be gift – for a special friend or for yourself. 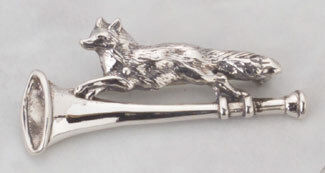 Our final selection of fine fox jewelry for today is this classic sterling silver fox on horn stockpin. Here we see the fox at his most majestic, running, tail flowing, head high and ears pointed, alert and on the move. The fine detailing on the fox contrasts beautifully with the smooth lines of the hunter’s horn; a beautiful juxtaposition of animal nature and created grace. 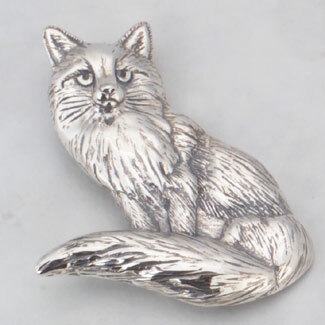 Perfect on the lapel – this silver fox stock pin looks great on a jacket!